AQS have had the pleasure of working with some of Irelands leading brands including Guinness, Aer Lingus and the DAA, just to name a few. Below are some case studies outlining the work we have done for these companies so that you have a better understanding how we can improve your business. 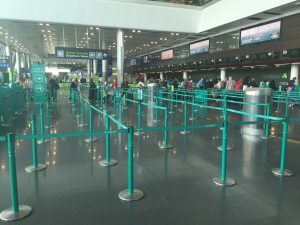 For many years, we have worked with Aer Lingus in providing their queue management solutions. The passenger journey begins from the moment the passenger enters the terminal. It is this “journey”, the in-house experience in its entirety, which will keep the passenger engaged from arrival through to departure. Every day you can see our Tensabarriers working in airports around the world helping Aer Lingus passengers on their way. The passenger journey can be frustrating at the best of times so our queue solutions help minimise waiting times, improve passenger safety, lower risk of injuries and reduce passenger stress levels. 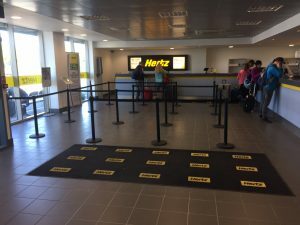 Hertz were unhappy with how their queue system was operating and invited AQS to have a look and see what improvements could be made. We spent some time observing the behaviour of customers during busy periods and it became obvious that the configuration of the queue system and a lack of directional signage was causing confusion. This led to queue hopping which in turn led to customer frustration. AQS designed a new queue configuration and introduced post top signage providing clear messages to customers. The results of this were evident almost immediately and has led to customers getting a more efficient and quicker service. 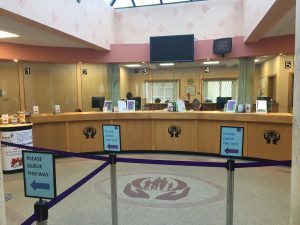 AQS were delighted to be invited by People First CU in Athy to give our recommendations for their queue management system in their new offices so that efficiency levels and customer service could be maximised. Following a site survey, we responded with our suggestions and costs. This included our SLQ1000 Electronic Call Forward system (ECF) as well as queue posts and signage. Soon after we won the contract the installation was completed much to the delight of the staff. Our ECF system serves customers in the order they queue. It is a trialled, tested and proven service that increases efficiency, reduces service times and manages the flow of waiting customers to available service positions. After the success of this ECF unit in Athy, we also fitted a similar ECF system in Trinity CU, Donaghmede. 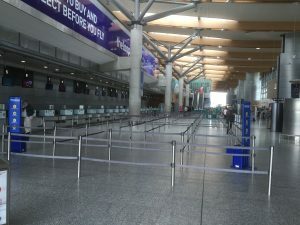 When AQS were contacted by Cork Airport, it was clear they wanted to manage their queue requirements a little differently; challenge accepted! Their preference was for fixed queue posts instead of the more popular freestanding alternative. Opting for this solution meant we needed to be sure of the queue configuration. In consultation with us and following a number of visual presentations the best solution was agreed. The posts are socket mounted and can be removed and in some cases where there is no post, a plug is inserted in the socket. This queue solution provides added stability in applications with established traffic patterns and ensures that the post location is always correct with a minimum footprint, creating a queuing system that minimises waiting time and ensures greater efficiency.